FULTON, NY – It is said that there is a fear of the unknown. As part of Oswego County Opportunities (OCO)’s recognition of May as National Mental Health Awareness Month, the agency’s Mental Health Residential Program is looking to erase the fears or misconceptions that may exist in relation to psychiatric illness by joining a nationwide effort to raise awareness of mental health and the resources that exist to aid those facing mental health issues. 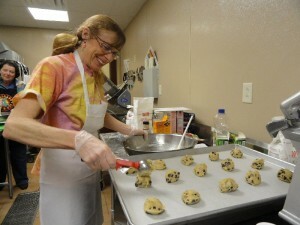 Carolyn Hart, coordinator of OCO’s Mental Health Department, prepares to bake some homemade chocolate chip cookies for the Community Organizations Fair held recently at Breitbeck Park in Oswego. In the background is Peg Thompson, mental health transitional living supervisor with OCO. Representatives from OCO’s Mental Health Transitional Living Program have made several appearances this month to distribute information regarding psychiatric illness, discussing how their program can be of assistance to those with psychiatric illness, and empowering community members to help raise the awareness of mental health by wearing the green ribbons they received and becoming familiar with the mental health resources that are available in Oswego County. Supervisors of OCO’s Mental Health Residential Services Program, Apartment Treatment Program, Peg Thompson and Residence Supervisor, Beth Thompson, recently attended the community organizations fair at SUNY Oswego and the Mental Health Awareness event hosted by Families of those with Attention Deficit Disorder at Breitbeck Park in Oswego. Throughout the month of May, and the months ahead, Beth Thompson said that the Mental Health Transitional Living Program would continue to raise the awareness of mental health and work to eliminate some of the myths of mental illness. “There are many misconceptions when it comes to psychiatric illness such as, people with schizophrenia are dangerous and unpredictable; those with post traumatic stress disorder have weak characters, and so on, the list of myths relating to mental health is endless. We are working to educate community members by educating them on the truths of mental illness and how it can be successfully addressed,” said Beth Thompson. OCO’s Mental Health Transitional Living Program offers both a Supervised Residence and an Apartment Treatment Program. Each are designed to help those diagnosed with a psychiatric illness meet their life goals and provide them with the tools and support they need to progress to a more independent life style. A Family Care Home Program is also offered, for those desiring to live in a private home ‘family’ atmosphere with support and guidance of a caring family. “Our sites provide consumers with a safe environment and a recovery based program that is person centered and focused on helping consumers achieve the goals they have established for themselves. Our consumers, who come to us on a referral basis, enjoy an open ended stay that offers them the opportunity to leave when they are ready to live independently. We provide them with rehabilitative services such as skill building that will help them transition through the program and into more independent living in the community. Once they do, we link them with community supports as needed to ensure that they will maintain successful independent living,” said Peg Thompson. In addition to these local efforts, Peg Thompson, who is also a on the board of directors for the Oswego County Mental Health Association, traveled with Beth Thompson to Albany to attend Association of Community Living’s Lobby Day. Together with staff members and several OCO MHTL consumers, they met with Assemblyman Will Barclay and Sen. Patti Ritchie to share their concerns regarding legislation and funding issues affecting mental health issues. “It was a worthwhile experience. Assemblyman Barclay and Sen. Ritchie welcomed the input of the consumers that made the trip with, and allowed staff the opportunity to advocate on their behalf,” said Peg Thompson. In addition to its consumers, Thompson added that OCO’s Mental Health Transitional Living Program also benefits its community. “This program helps to decrease individuals reliance on hospitalization as the only avenue for assistance, which is very costly. It also helps to addresses the issue of homelessness and makes the community stronger by empowering individuals and engaging them to become active members of their community,” she said.